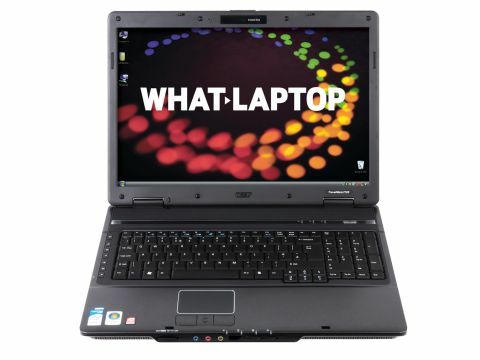 Acer's TravelMate 7720-302G16 (£799 inc. VAT) is built for business users with a need for multimedia power. While there's little to define it as a corporate laptop, it's a reliable desktop replacement for home use and short journeys. Its 17-inch chassis weighs 3.6kg, so you won't want to carry it too far. When running at full power the battery lasts 107 minutes, but Windows Vista's Power Saver mode increases this to 128 minutes, for basic travel use around town. The chassis is large, and a full-size keyboard is used. All keys are large and accessible, and responsiveness is excellent. Business users will also appreciate the addition of a full numeric pad for fast data input. The use of a 17-inch Super-TFT screen is uncommon for a business laptop, but suits media editing use. Reflections are increased, so indoor use is preferable. Unfortunately, image quality and colours are below average and lack definition, despite the high WXGA+ resolution. A built-in camera above the screen improves connectivity for mobile workers. It's easy to take photos and use live video messaging using Acer's preinstalled software. A tiny Bluetooth phone is also included for VoIP use and slots into the ExpressCard slot for recharging. Day-to-day performance is strong. The Intel Core 2 Duo processor and 2048MB of memory makes multi-tasking quick and easy, even when editing video and photos or running virus scans. 3D performance is also strong for a business laptop, but not class-leading. The ATi graphics card improves high-definition playback by using graphics power rather than the CPU to process the video. Basic gaming is also possible. Comprehensive storage is provided by the 160GB hard drive, for all your business and media files. The dual-layer DVD rewriter can be used to save up to 8.5GB of data to compatible discs. A 5-in-1 media card reader also lets you easily share files with cameras and PDAs. As well as a full internet security suite and CD/DVD creation tools, Acer has included a range of proprietary software. Making it easy to configure network settings, data security and system recovery tasks, all users can be up and running in a matter of minutes. More of a consumer system than a dedicated business tool, the power, usability and features of the TravelMate 7720G-302G16 are great for the price. While the below-average screen limits professional media editing use, there's still plenty to recommend it for use in the home or office.